Curcumin or Turmeric is a spice derived from the roots of the Curcuma longa plant. Being native to South Asia, this spice has been used in Indian cuisine for centuries. The rhizomes are boiled, dried and ground to make turmeric powder. 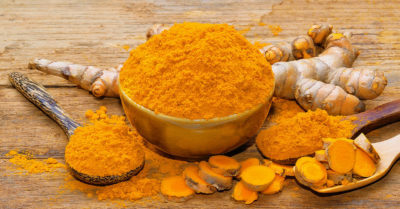 This powder is deep yellow-orange color and has a very earthy, slightly bitter and slightly spicy taste and a mustardy odor due to the presence of a substance called curcumin. This spice has been part of the culture and tradition of India since immemorial time and is considered a remedy for its anti-inflammatory and therapeutic properties. Being a natural cosmetic product can be used to beautify your skin. Curcumin, on the other hand, can treat some age predators such as Alzheimer’s disease, diabetes, allergies, arthritis and other chronic diseases. Turmeric is useful because of its antiseptic and antibacterial properties that combat the secretion of oil by the sebaceous glands. You can mix turmeric powder and sandalwood powder and add lemon juice to the mixture. Spread on the face for five to ten minutes and rinse with warm water. For acne scars, apply a mixture of turmeric and pure water for 15 min. Use only at nights. Turmeric is also good for oily skin as it regulates the production of sebum, an oily substance produced by the sebaceous glands. Sandalwood acts as an astringent, orange juice is a source of vitamin C, helps to cleanse the stains. For oily skin, prepare a mixture by mixing two tablespoons of sandalwood powder and a pinch of ground curcumin (turmeric) with three tablespoons of orange juice and spread it on your face. Leave it on your skin for ten to fifteen minutes and rinse with warm water. Only use it at nights. There is a solution for dry skin; you can make a face mask by combining one egg white, two drops of olive oil, fresh lemon juice and water and a pinch of turmeric. This can be used over all dry areas, such as the face, neck, elbows and knees. Allow to dry thoroughly and then wash with warm water. Apply at nights only. Turmeric in combination with other ingredients is effective in reducing fine lines and wrinkles. You can prepare a poultice by mixing curcumin powder and rice powder with yogurt and tomato juice and use it on the face and neck for 30 minutes. Rinse with lukewarm water. This will reduce wrinkles and lighten the skin. If you have dark circles, you can add a pinch of turmeric to 2 tablespoons of buttermilk and use it carefully around the eyes for 10 minutes. Rinse with cold water by doing so you will be removing wrinkles as well as dark circles with…. turmeric! Turmeric helps you fight aging!